At a May 2017 meeting between Deputy Attorney General Rod Rosenstein and then-acting FBI Director Andrew McCabe, a week after President Trump had fired James Comey as director, Rosenstein suggested that McCabe or others wear a wire when speaking with the president, according to memos McCabe made of the conversation, sources familiar with them told ABC News. Additionally, sources tell ABC News that, according to the memos, Rosenstein told McCabe he could recruit members of the president’s Cabinet to invoke the 25th Amendment to remove Trump from office for being unfit. Rosenstein believed he would be able to persuade Attorney General Jeff Sessions and then-Homeland Security Secretary John Kelly to sign on, according to the sources. The White House, as of Friday evening, had not commented specifically on the story. Deputy Attorney General Rod Rosenstein speaks during a news conference at the Department of Justice on July 13, 2018. But Trump, speaking at a rally in Springfield, Missouri, once again attacked his Justice Department. "Look what's being exposed at the Department of Justice and the FBI," the president told a packed house Friday night. "You have some real bad ones. You see what's happening at the FBI -- they’re all gone, they’re all gone. But there’s a lingering stench and we’re going to get rid of that too." The May 2017 meeting was one of two attended by Rosenstein and McCabe, sources said. In the first meeting that morning that Rosenstein made reference to the possibility of putting a wire on someone to record conversations with Trump. It is in this meeting that Rosenstein also raised the 25th Amendment, two sources familiar with the meetings said. The second meeting, later in the day, had more people present, they said, including other senior Justice Department officials and then-FBI attorney Lisa Page. In this meeting, Rosenstein again raised the idea of putting a wire on someone to record Trump, the sources said. Some in the room left the meeting believing he was joking about the wire idea, but McCabe and Page left the room thinking otherwise, according to the sources. McCabe and Page both wrote their own notes about the meetings, and while Page's notes also mention Rosenstein bringing up the idea of putting a wire on someone to record Trump, Page's notes do not reflect any suggestion that Rosenstein was joking, according to one source familiar with the matter. However, another source familiar with how the Justice Department officials who attended that later meeting viewed what happened, said their belief was that Rosenstein was being "sarcastic" -- noting that there was never any follow-up conversation from Rosenstein or anyone else about it. This source said that the meeting was essentially just a discussion about the events the week before and everything facing DOJ in the wake of Comey's firing. “It was a difficult time for [the DOJ and FBI]." "Nobody was angry or acting out" in the meeting, but "it was just sort of intense. It was a very intense time," the source said. Nevertheless, this source said it was unclear even to those in the meeting how McCabe interpreted Rosenstein's comment. “I don’t know what Andy thought. He keeps his cards close,” the source said. Acting FBI Director Andrew McCabe appears before a Senate Intelligence Committee hearing about the Foreign Intelligence Surveillance Act on Capitol Hill in Washington, D.C., June 7, 2017. In his initial statement Friday afternoon, Rosenstein pushed back on The New York Times report but did not flatly deny it. 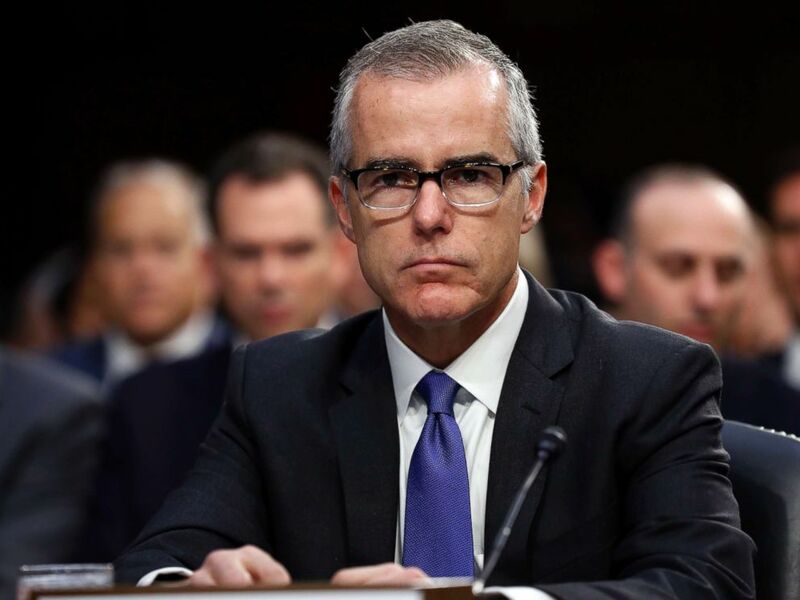 In response to the story, McCabe’s attorney’s issued the following statement to ABC News: "Andrew McCabe drafted memos to memorialize significant discussions he had with high-level officials and preserved them so he would have an accurate, contemporaneous record of those discussions. When he was interviewed by the Special Counsel more than a year ago, he gave all of his memos – classified and unclassified – to the Special Counsel's office. A set of those memos remained at the FBI at the time of his departure in late January 2018. He has no knowledge of how any member of the media obtained those memos." After Comey's firing, ABC News reported that Rosenstein was so upset with the White House for pinning Comey’s dismissal on him that he was on the verge of resigning. 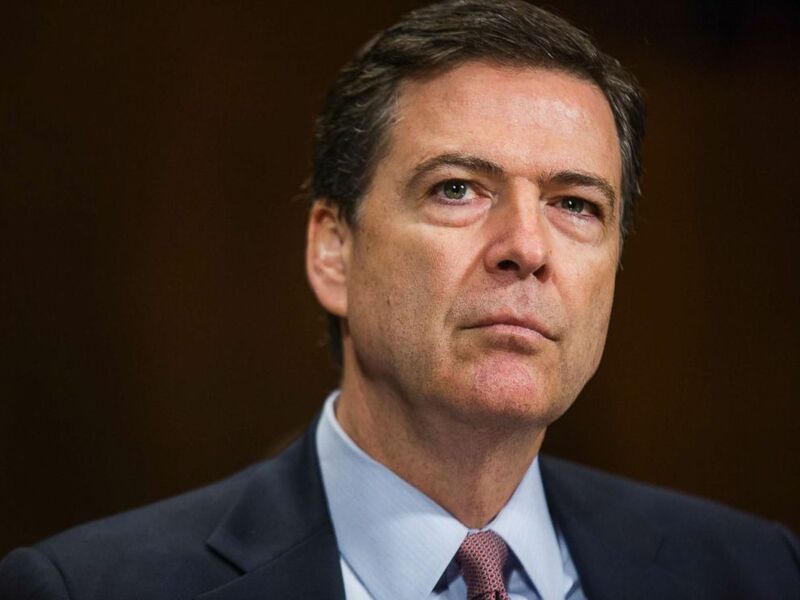 File photo of FBI Director James B. Comey testifying in front of the Senate Judiciary Committee on Capitol Hill in Washington in 2014. 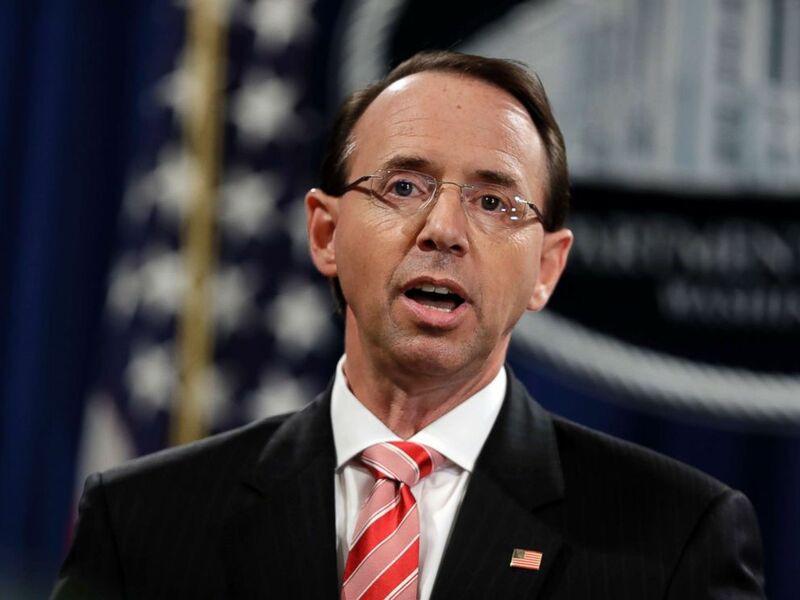 Rosenstein remained on the job and a week later assigned Robert Mueller as special counsel to "oversee the previously-confirmed FBI investigation of Russian government efforts to influence the 2016 presidential election and related matters." In the months since Mueller’s appointment, Rosenstein has been responsible for overseeing the Russia probe, often holding press conferences to announce indictments brought by Mueller’s team of prosecutors. Rosenstein’s leading role in the Russia probe came as a result of Attorney General Jeff Sessions’ recusal from all matters related to the presidential campaign to avoid conflicts of interest. On Capitol Hill, Republicans have targeted Rosenstein in their criticism of the Justice Department’s handling of the Russia probe. In July, 11 House Republicans introduced articles of impeachment against Rosenstein and accused the Justice Department of hiding investigative information from Congress, abusing the Federal Intelligence Surveillance Act, and failing to comply with subpoenas.